My best wishes to everyone for this 2010 new years ! At present time , it seems that I hit the limit of my K27-7200 turbo. Actually, using my boost controller which is RPM programable, I was able to test a lot of boost setting. Today, these numerous test lead me to think that the compressor side of the 7200 is able to maintain high pressure (1.2b) until the red line ( 6500 rpm). However, in the mean time, the turbine side ( hot side) is not able to " follow" and the back pressure which is created kills the engine efficiency. In fact , I strongly believe that the exhaust flow is too much restricted by the hot side. So the back pressure is too much increased and the exhaust flow can not get out correctly ( I think too much burned gas are not evacuated of the barrels) . This is not a secret , as many expert think, I also suspect the back pressure to be the key point either. 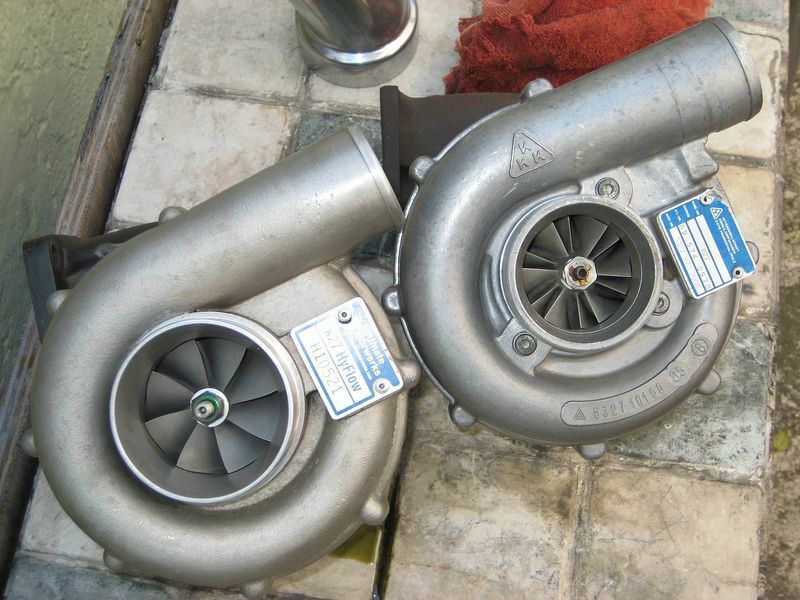 In order to improve my setup, I am thinking to upgrade my turbo. My purpose is not to extend the efficiency to lower RPM . I want to keep the on/off behaviour of my car ( I reach 1 bar at 3400 rpm and get 60 mkg of torque @ 4200 rpm with 1.25 bar of boost) .... I don't want to change this behavior.... I want to keep it ! But I would like to improve the top end ( from 5300 rpm to 6200 under 1.2 bar). I know that some will suggest to use GT35 turbo. But by philosphy, simplicity ( no water cooling and it goodies) and reliability , I don't want to go in this direction. I do prefer a turbo which could be directly bolted on. I know that some others will suggest to use a K27 HF. This turbo is quite interesting. However, as it keep the hot side than the usual K27-7200, I suspect the K27-HF turbo could get some limits due to the back pressure at high RPM. I do believe the bigger wheel allow the intake the get more pressure & more flow at lower rpm. However, I suspect the back pressure to be nearly the same at high RPM under the same boost pressure & flow. So finally , the power gain at high RPM can be obtained only from the intake & cams improvment in order to keep the boost pressure near 1 bar.... yes that's true that a minor improvment can also come from the it cold side side which could provide colder air. But it is not such huge I think. I made a lot of research on this forum and others. I read all the opinion and thought from everyone. At present time, it seems the K27-7006 is able to carry more boost pressure & flow until red line because it hot side is a bit bigger than the K27-7200 and although it compresssor side is a bit smaller ... ! If the informations I read and my understanding are correct, the K27-7006 hot side casting as well as the turbine are a bit bigger. If the informations I read and my understanding are correct, the K27-7200 cold side casting as well as the compressor wheel are a bit bigger. So question for the experts, would it be a possible to build an hybrid turbo using the hot side of the K27-7006 coupled to the cold side of the K27-7200 ? Are the parts compatible ? Is it mechanically possible ? Would it be possible to get this described turbo from a turbo tuner or spécialist ? Additionnal question, would it be possible to get a titanium turbine wheel in order to reduce the inertia ? All idea and thought are welcome !!! Hey Thierry, Happy New Year to you as well. Have you tried bolting on a 7006 yet? You may find that it accomplishes what you've looking for without having to mix-and-match wheels and castings. I feel the people that do special turbo builds have probably taken all of your thoughts into consideration, so let's see what they have to say. Maybe the HF is the best all around compromise. On my 7006, I generally get full boost between 3600-3800 rpm, and yes it does pull well up on top...though I've never pushed my car to redline. What we all need is an international turbo lending program. Were you able to compile data showing that the backpressure is too great at high rpm? Nevertheless, it will be interesting to see results of a bigger turbo when you get around to installing one. The turbo you are describing is the K27HF. It has a similar threshold as the 7200 but will carry boost past 7000rpm where the 7006 drops off. The HFS has an even lower threshold. Contact me via e-mail and I will get you all the technical information you desire. "would it be a possible to build an hybrid turbo using the hot side of the K27-7006 coupled to the cold side of the K27-7200 ? Are the parts compatible ? Is it mechanically possible ? Would it be possible to get this described turbo from a turbo tuner or spécialist ? Additionnal question, would it be possible to get a titanium turbine wheel in order to reduce the inertia ?" The answers to all the questions before the last one is yes. The compressor wheel is a heat treated aluminum alloy so I don't know if titanium would be lighter and have less inertia. Also while the 7006 compressor wheel exducer is smaller than the 7200, the inducer appears to be the same 52mm diameter, they have 2.75" compressor housing inlets and I don't know if the pitch or angle and depth of the turbine blades may be different between the two? I'm not an expert and none of the usual posters I've seen here is a turbo expert even though there are self appointed experts. The HFS uses a stock K27 7200 turbine wheel and housing, the same K27 bearing housing, same backplate with the shaft hole drilled bigger, but it has a larger 61mm Holset compressor wheel and an unmarked 3K compressor housing with a 3" inlet that fits the Holset wheel size and contours correctly. I would suggest calling or emailing a professional turbo rebuilder and asking them your questions to get accurate answers. I'm sure there are places in Europe just as good and on the average better because 3K Borg Warner won't sell parts to just anybody in Europe, they only sell parts to certified turbo rebuiders.... while over here Borg Warner will sell parts to anybody regardless of their ability that will buy a certain dollar amount of parts. As far as the increased backpressure of the HFS over the 7006, maybe a bigger wastegate or 2 smaller wastegates would take care of that problem. Here's a pic of a UMW K27 HFS and a K27 7006 side by side to show the difference in size of the turbine wheels and housings and the compressor wheels and housings. The HFS is on the left in these pics. From everything I've heard and read a ball bearing Garret GT35R totally blows away anything made by KKK, the newer 3K Borg Warner units, or any hybrid using 3K and Holset parts. Additionnal question, would it be possible to get a titanium turbine wheel in order to reduce the inertia ? I think you are referring to a Titanium Aluminide turbine wheel, as Titanium is not a suitable material for turbines. If you are, and you are willing to use a completely different turbo, you can PM me and I will provide you some info on that technology. I agree with your conclusions on reducing the hot side back pressure. We are not the first to figure this out and it is a basic turbo trade off. Efficient HP or earlier boost onset. I think Eddy Bello dose not hit full boost on his 3.6TT 1200hp monster until about 5k rpm. However, when they do come on they are operating at there most efficient range on the hot side as well as the cold side. I once thought exactly as you that we should try mating of the 7200 with its newer compressor wheel w the 7006's less restrictive hot side. However, there dose not seem to be enough difference on the compressor side to maybe warrant the effort it seems. As noted above, you might be happy with the 7006. Andial and Porsche were when they took the 1992 C2Turbo into IMSA racing. However, at the HP levels you are talking about the 7200 and 7006 compressor wheels are moving off there peak efficenty islands. I once had an HF built on a 7006 hot side. It did build boost a little later and slower but did carry well up top. I did have overboost issues with it if I tryed to run under 1 bar. Building an HF on a 7006 might be something to look at if they can still come up with the parts or you find a good core. This would be close to an old school K29 hybrid I suspect. This may seem an odd comment but there seems to be something special about compressor wheels for a 930 when they get to around 60mm. This seems to put a CIS 930 in the sweet spot of the efficiency island. I do not know if much is gained going past 60mm. The challenge is finding the right hot side combination to free up there potential. This is easier done with the GT 35 or Turbonetics 60-1. 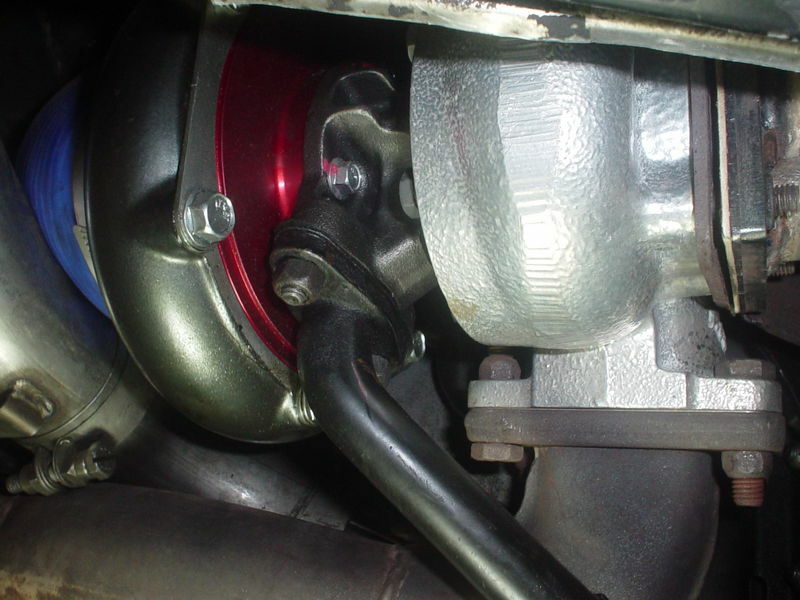 As most CIS owners seem so set on reducing lag the market place build turbos with small hot sides and big compressor wheels no mater if they sometimes over-boost or increase resident exhaust pressure. The work and that is all that matters. Part of the key I suspect might be keeping the size of the hot wheel in proper per-portion to the compressor wheel. It is a leverage thing. I am wondering if putting a 62mm wheel with a little 7200 compressor wheel is like putting 27" wheel on a car that is geared to work well with 25" wheels. It make the car go faster with each turn of the wheel but it takes longer to get to speed. My thought is we first need to come up with a proper size turbine wheel to keep the balance we need, then we need to mange the A/R or porting dimensions of the housing around it. Another approach might be to try to increase the efficiency of the exhaust system its self. I do not think increase WG capacity is going to help. It would help however with over-boost if the compressor wheel is turned to fast by a small hot wheel. Maybe something like Brian's equalized primary and secondary lengths that better time the exhaust events could help some. Playing with the primary and secondary tube lengths and diameters might have some effect if they are to small. However, to me the opportunity could be managing the hot wheel leverage working against the compressor wheel load to reduce back pressure. Not an expert, just what I believe. Happy New Year, buddy. Those stories of poor reliability with Garrett's are the stories of urban myth. 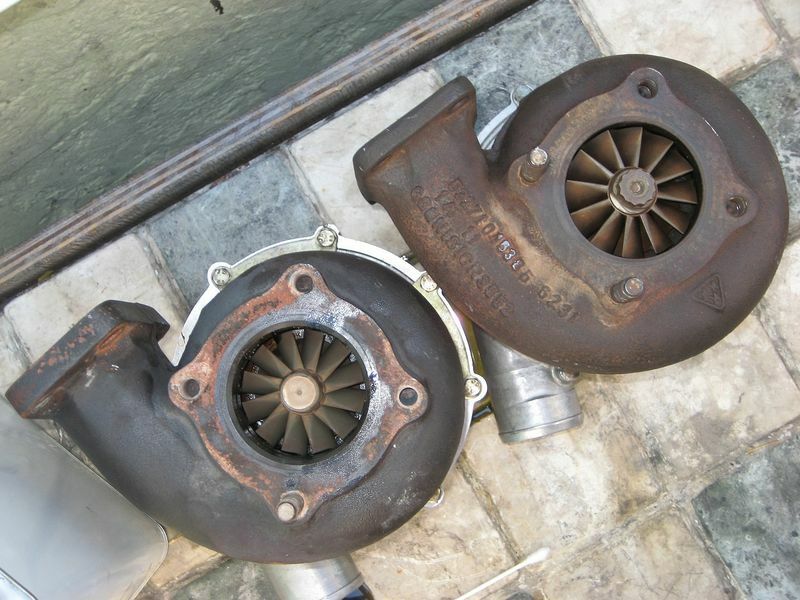 Failures have occurred from people who install turbochargers like they are putting in an air cleaner. For the sake of clarity, you can order the Garrett's with oil-only cooling/lubing, T3 or T4 Flanges, various turbine and compressor A/R's. Seriously, I know you want to keep it simple with a KKK, but let's face it, you're settling for 70's technology. What you need is a complete kit which would include the correct oil feed lines, proper sump lines, fittings AND the proper turbocharger designed with one engine in mind.....YOURS. I can't stress it enough, find a highly recommended turbocharger tuner shop, tell them what you have on your engine for mods, where you want your power mapped. We have a turbo supplier at the shop I work at occasionally that has supplied everything from mild KKK hybrid's, street Garrettt's, to wild FabCar GTP1 993 turbo monster track cars. PM me if you would like to discuss your options with him. BTW, I'm not affiliated with the turbo shop in any way. Like I said, there seems to be somthing speciall about a 60mm compressor on a 930. Then we just need to tailor the hot side. Maybe a larger wheel w a smaller AR and adequate WG capacaty would give fast boost onset and still maintain reasonable exhaust manfold pressures. We can make big HP with small turbines but more with larger ones I suspect. Mixing and matching old 7200/7006/etc components would be using old technology. Machining new components for the K27 frame is applying new technology to a bolt-on turbo. 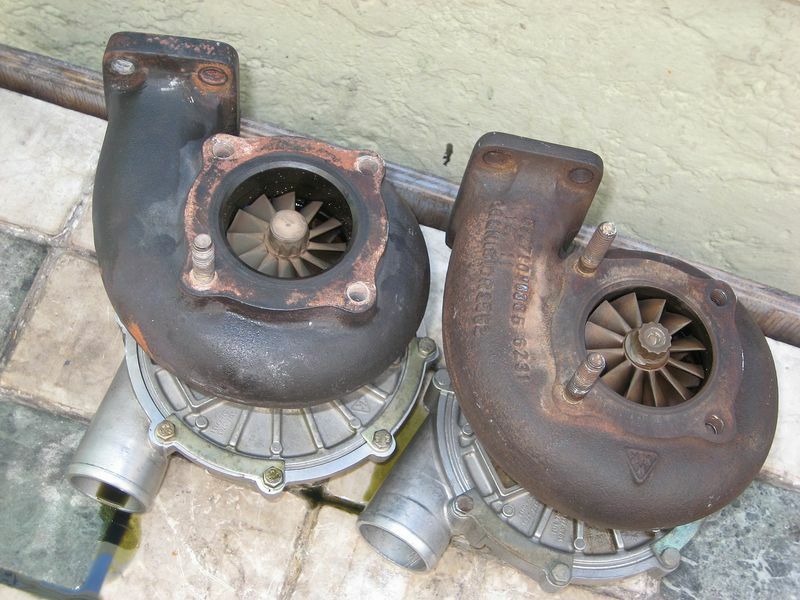 That is what has been done to create the S/HF/HFS turbos. Do any of those turbos have a hot side larger than a 7200 or an option for a hot side larger than a 7200? That's a good question .... I am also wondering about it ? Thanks a lot for your interesting inputs ! I didn't mentionned that the GARETT are proned to fail ! They are certainly reliable when they are correctly choosen and correctly installed. I still have some doubt about the ball bearing design which reduce a little bit the lag but which is certainly less reliable for very long term period. As you said, that's true they come with a some huge adjustment possibilities. I think now as time goes by it has been proven if installation is correct with all the correct mods,,then you dont need a water cooled car to make these Garrets last,,if you do a search you will see quite a few happy customers on here on this forum! Personally i think i would go Garret if i was going to replace! Is the GT35 not just a little big for what we need when were at the 400whp @1 bar? ?...Can you customise the GT35 series to near exact to suit our applications? I still do not understand how you can reach 460 Flywheel HP with your very similar setup than mine ! What I like about the Garrett is that the compressor map is available to everyone. Can't say the same for the KKK hybrids; on those you will just have to take the manufacturer's word on it that they are more efficient than the old K27. If "broke his turbo" means he sheered a shaft, that is usually for from compressor stall that comes form a BOV malfunction than how much the bearings are cooled. Risk for this is increased by eliminating the de-accel valve and or running a larger than stock compressor wheel. Sometimes tubos built on a T3 frame can have smaller shafts that can make them more susceptible bit I think most the tubo's in our flow range now have more substantial shafts. Not having a map should not be to big of a deal. I suspect if you can find a compressor wheel that is very close in dimension to a non mapped wheel you can get pretty close to understanding the map of a non rated wheel. There may be some fine differences in efficiency that come from the fin design but I suspect it is not that much compared to other decisions or changes that effect the total package. Maybe a point or two more efficiency at close to the same flow rates. Getting the motor on the right part of the compressor map at TQ and HP peak is probably a much bigger issue. I just do not think there is as much magic in the fine points of the compressor impeller design as the magical turbo builders what us to think. Other factors can quickly become more important. I do not think one is going to find that much difference between a HF, 60-1, 62-1, or GT 35 compressor wheel if all other factors were the same. All those compressor wheels are a great fit for a 3.3 making up to 500 hp and more efficent than stock on a motor making near 400hp. Add in ball bearings and changes to the hot side and there is going to start to be potential for a performance difference. One of the problems with a 930 is the metering assembly adds restriction before the compressor wheel. Turbos do not like any restriction before the compressor wheel or after the turbine wheel. Restrict these and the performance will fall off quickly. Thus, I suspect turbos with large compressor wheels and small hot sides that can work well with EFI motors, are not the best fit with CIS. We have to keep the hot to cold side ratios somewhat in ballance. Other wise we have a turbo that might start to boost sooner but takes a long time to reach full boost and end up with high header pressures as the compressor wheel's higher torque fights against the the small turbine wheel. Just my opinion for what it is worth as I have a lot to learn about Turbos. You could also go on and say you could also find many a person with a failed KKK series. "I still do not understand how you can reach 460 Flywheel HP with your very similar setup than mine"
p.s i have completed some 60-130 mph times if you would like to compare? Last edited by stup; 01-03-2010 at 02:02 PM..